I remember one of the first mobile phones I ever used being a Nokia 5110i. It was among Nokia’s earliest of devices that packed an easy to use and straightforward interface in a supremely well-built package. Since we didn’t have as many phone launches each month back then as there are stars in the sky, the 5110i served me very well for more than 3 years without showing any signs of aging. That was in the mid to late 90’s. Fast forward to the end of this decade and we see Nokia’s current flagship, the N8-00, continuing to hold on to the Nokia tradition of building what are arguably some of the best constructed mobile devices on the market. In fact in many ways, with the Nokia N8-00 (referred to as the N8 from here on) it seems as though Nokia has let its hardware and industrial design teams have a field day; this phone feels almost over engineered when held in your hands. While the current flagship demonstrates Nokia’s engineering prowess quite well, previous models seemed to epitomize what I felt was the company’s philosophy; build the software around the hardware. This worked just perfectly for as long as mobile phones were just that, devices used to make and receive calls and/or texts. Sometime in the last decade, Apple, Google, Palm and Microsoft redefined mobile experiences, and as a result old flaws have slowly become gaping holes in the Finnish device manufacturer’s proverbial armor. The N8’s symmetric design is attractive in a very understated manner. It won’t immediately grab your attention in any way if you look at it. The 3.5” 640 x 360 AMOLED screen commands the majority of the real estate on the front with tapering edges on all 4 corners. The menu/home button at the bottom left corner is the only detail on the face of the phone which narrowly saves the N8 design from being branded bland. While the button did seem a bit oddly placed when I first saw it, the overall profile and weight distribution of the phone didn’t lead to any issues in actual use (although left-handed users may disagree). Upon closer inspection, you will find the front facing VGA camera, the ambient light sensor and the proximity sensor sitting behind the (Gorilla) glass on the top right corner. The left side houses a well-constructed but tad finicky and plastic “suicide” door of sorts to cover the microSD and SIM card slots. There’s also a multifunction micro-USB port (more on this later) and a charging light indicator. The right side seems a bit busy with the volume controls, a spring loaded screen lock button and a 2-stage camera shutter button. This is the only part of the phone that I have issues with, when it comes to design. The volume controls have a lot of play and don’t give good feedback when pressed. The spring loaded screen lock button, while a good idea in itself, is not well placed. On multiple occasions, I kept hitting the volume button while attempting to lock the phone. The left and right sides of the Nokia N8. Notice how it cannot lay flat on its back. The top of the phone plays host to a 3.5mm jack (that can also serve as an AV-output if used with the appropriate connector), and a mini-HDMI port hidden behind a plastic flap and the power/profile selection button. At the bottom you will find a lone connector for your charger, although it could easily pass off as a microphone because of its placement and size, along with a lanyard or strap port. The rear of the phone prominently shows the N-series branding and houses the crowning jewel of the N8; its 12MP Xenon-flash assisted autofocus camera. Because of the complexity of the camera module and the associated optics used in the N8, the camera itself (along with the loudspeaker) is housed in a bulge, and as a result the phone cannot lay flat on any surface. While that in and of itself isn’t an issue, what concerns me is the possibility of excessive visible wear appearing on the lower part of this bulge as it is the only part of the phone that comes in contact with any surface when the phone is made to rest on its back. Also, something I did notice was the fact that just within a week of use, dust started accumulating in the crevice between the top of the bulge and the back of the phone. 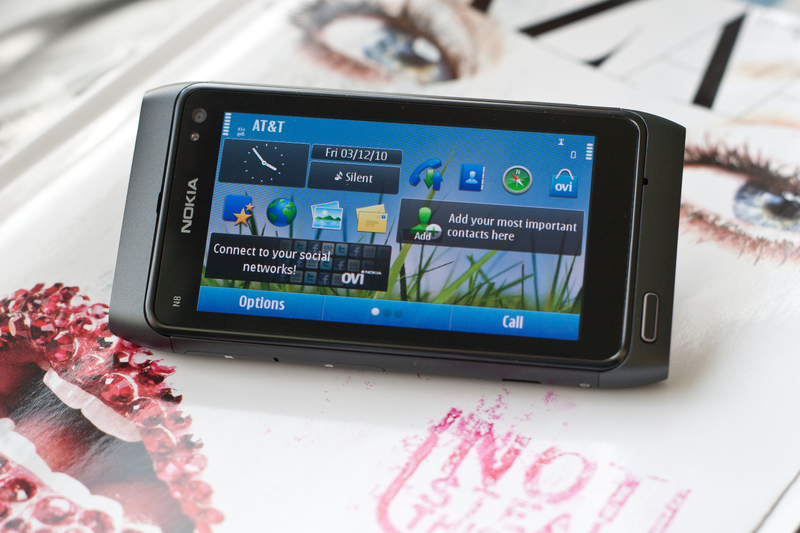 "And with one such update promised for the N8 sometime in Q1 2011, it may be the device to recommend, after the update." Unfortunately, after the update this phone will be what, 6+ months on the market? With no more flagship phones running on Symbian I'd never recommend this OS to a friend, even if they are familiar with Symbian. other reasons to not recommend: wifi pathetic, talk time sub par by today's standards horribly slow web browser (which is why you need more 3g battery life- the damn pages take forever to load! ), screen res below what I would call the current industry standard (thanks to android devices), and lastly when you make an unlocked phone that you are trying to sell for ~$600US (typical for Nokia flagships) you DO NOT put in a 99 cent ARM 11 chip!! Can you say overpriced? And where the heck is the 1500 mAh battery found in almost every other nokia phone? I guess when you lose that much marketshare you can't afford to put quality components in your flagship. My guess is that Nokia already had this camera/sensor/flash prior to their imminent demise. Same with the 1200 mAh batteries now found on their phones. Sad really. Firstly, it is not selling for $600. It can be found for $399 at a lot of places and newegg is selling it for $429. For an unlocked pentaband phone, that's not a bad deal, especially since it comes with a camera as good as found on $400 compacts (S95, LX5 are ~$400). Secondly, Mithun's 3G talk time results seem egregious to me. The GSM talk times are a lot longer (I've had hour long conversations on the phone that did not dent the battery gauge, sadly don't have the resources/money to test talk times like AT), and there's not much to gain from going 3G for talk anyway. The CPU is slow, yes, but it's not a handicap for the device in practical use. It's as snappy as a 3GS, and the GPU is great for gaming - played Angry Birds, NFS Shift and Galaxy on Fire with no slowdowns. It's also played 720p videos without a hitch - remarkably, the phone stayed cool to the touch even after a 1 hr+ video session with a 720p mkv for me. Slow webkit browser is slow, fortunately Opera Mobile is decent for general web use (as opposed to synthetic benchmarks). Definitely one area Nokia could improve on though. <sigh> there's always a nokia fanboy that bought the phone and has to post to defend their purchase... Yeah newegg has it at $429 now but do you see the "was $549"? That would make it MSRP of $549 which last time I checked would make it "~$600" (just south of $600). My point is and still remains that if Nokia wants a NEW "flagship" phone it seriously falls short by today's standards (set by apple and android phones). And the 3GS is outdated. It came out in ~August of 2009. Is Nokia then trying to compete with 1.5 year old phone hardware?? No wonder they are losing that massive amount of their marketshare. If I want to play handheld games I will buy a DS or PSP due to large quantity of titles available for them. Let's face it, these days cell phones are for 2 main things. 1: making phone calls. And I don't care about GSM talk time. I don't want to have to go through all of the menus to find the obscure option to switch to GSM every time I want to have a long phone call and then back again to get online. 2: Quick web surfing, including posting tweets and facebook updates and the occasional youtube upload. And the numbers for Opera Mobile aren't that good either. I see you have no comment on screen res or wifi performance. Yeah it stays cool at the lousy res since anything higher will stress the "great GPU". It's the same as pc's- when you increase the res it's more demanding on the gpu. Sure it's got a great camera. Which is why nokia went out of their way to say it over and over so everyone would overlook everything else. Don't get me wrong, I'm not a Nokia "hater" as I have had numerous Nokia phones (most recently an E63). But I can remember the days that Nokia hardware across the board was innovative, not just feature packed. Using an outdated cpu, bad wifi, short battery life talk time (seemingly a nokia first), failing to get to 800x400... I basically already said these things. I expect better from Nokia (and so should you). Pricing varies a lot between markets I presume. For the sake of comparison the Nokia N8 costs ~4000 SEK here while the Desire HD is ~5100 SEK (recently dropped from 5600 SEK) and the iPhone 4 16GB is ~7000 SEK (~8300 SEK for 32GB). I can't speak for the rest of the world but it offers high-end smartphone features at a price point significantly lower than the competition.